Everyone likes to be able to soak in a bathtub, or may not want to use a traditional shower, but sometimes things can happen that make us unable to climb into a standard tub. This fact is why you should consider a walk-in tub; a walk-in tub combines the convenience of a shower door with the layout of a bathtub. 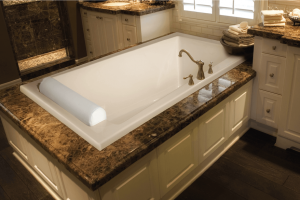 Getting the best walk-in tub for your home depends on several factors, which we’ve outlined. A wide range of products exists in this market, but we’ve tried to make it easier for you by researching and looking at walk-in bathtub reviews to find the best products for you. Ariel EZWT 3048– This walk-in tub has all the standard amenities of a walk-in tub of its kind, and it also includes six hydro-massaging whirlpool jets and 18 air jets. 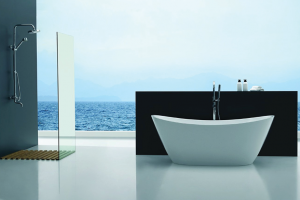 The tub is made of acrylic with a resin finish for the most security. The tub has a reinforced door for extra protection from falling but does not come with pre-drilled holes for the faucet. You’ll have to handle those yourself. 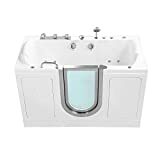 Deluxe Dual Massage QuickDrain Tub – This tub also features water jets that massage your muscles and joints with a combination of warm water and air. Its most standout feature, though, is the QuickDrain system, which can drain the tub in as little as a minute. A common flaw of bathtubs like this is users have to wait several minutes for the cub to drain so they can open the door. 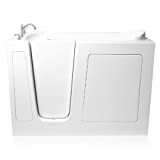 Ella OA3052 DH Malibu Acrylic – This tub has full digital controls, a thermostatic shower for maximum temperature control, and reinforced grab bars so you can get out safely. In order to protect you against coldness, the tub also has a heated seat and backrest. 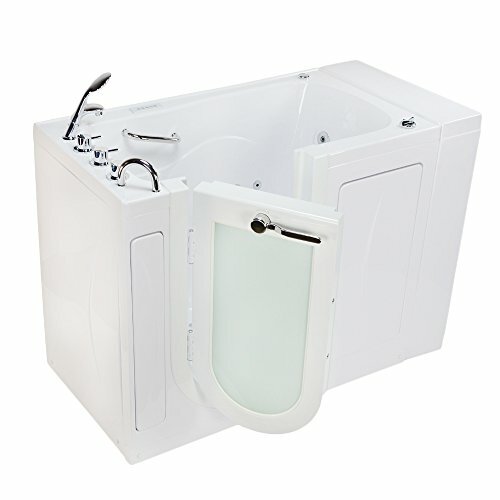 Companion Massage Walk-in Tub – Featuring a dual-drain system, this tub is perfect for couples who want to enjoy a long, relaxing massage together from the tub’s air jets and hydro jets. This is the only walk-in tub we’ve seen that’s specifically for couples, so it makes our list for this quality alone. 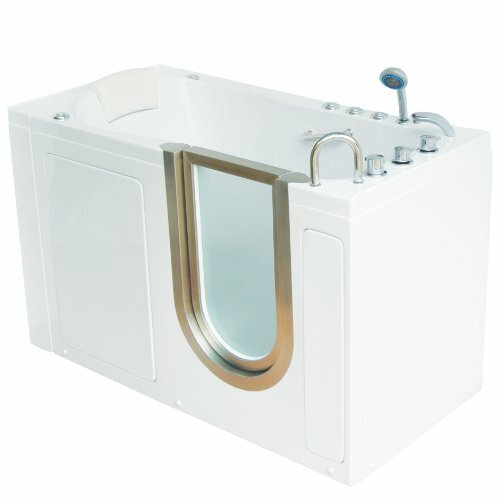 Lay Down Long Hydrotherapy Tub – Most tubs only are long enough to accommodate a person in a seated position. This tub, however, is larger and long enough to allow someone to lie down in the water for a more effective relaxation massage. It can hold up to 50 gallons of water, and has 24 massage jets located alongside inline heaters. Here, we go a little more in-depth about each product and address what we liked and didn’t like about each one. 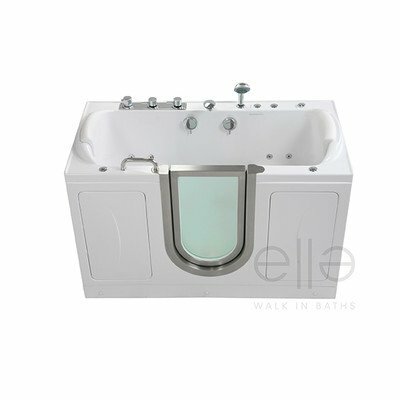 The Ariel EZWT is one of the best rated walk in tubs we’ve come across of this type. Its stainless-steel construction and layout, we think, make it a good sturdy choice for just about any bathroom. It has a left-side drain, which means that the drain is on the left when you’re looking into the tub from the point at which you get in. The biggest benefit we see is the presence of the massaging jets. Evenly spaced throughout the tub, you can see whirlpool jets and air jets, designed to agitate the water and create a massaging effect. There is also an inline heater designed to keep the tub warm while you’re waiting for it to drain. As far as the price goes, it seems like a worthwhile investment. 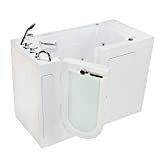 Deluxe Dual Massage Acrylic Walk In Bathtub -ETL Certified- 80sec Fast Drain System (LEFT Side Drain) 29.5" x 55" (59" w/ Extension) x 38"
The thing that immediately stands out to us about this tub is its dual drain system. Most tubs tend to take a while to drain properly, so anything that speeds this process along is good in our book. 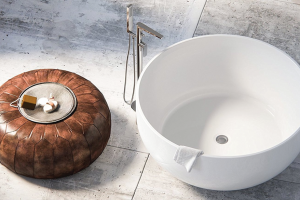 The tub itself is made of stainless steel and fiberglass, making it durable and easy to clean. We also notice the tub contains massage jets; in fact, it has more than most of the models we looked at. While this might make it more comfortable or more relaxing for the bather, you also have to remember that it takes more power to run these jets. You can turn them off, but it’s still something to consider. You can also remove the door. The idea behind this is easy cleaning, but it compromises the door’s safety and support. It’s a decent value for the price, but we’ve seen less expensive. This tub is the first one we’ve seen of its type to place such an emphasis on the comfort of the bather. While all tubs do to an extent, this one goes so far as to include a heated seat and backrest, so you don’t get cold while you’re waiting for the tub to drain. This tub is made of a mix of acrylic and stainless steel. Also, this tub includes upwards of thirty therapeutic jets total. Just like the previous tub on our list, it’s important to remember the power drain that using them will have. Regarding safety, we like that the tub has an outward-opening door. It locks in place for extra support, but the fact that it opens outward lets emergency personnel come in to help if there’s an accident. We also like that it has a pull-out shower, so you can clean hard-to-reach areas. Not all tubs have this feature. The most obvious thing we like about the Companion Massage Tub is that it’s meant for two people. Not only does this make it a perfect setup for couples’ time together, but it’s also a potential benefit to safety. Having another person in the tub with you, if you have mobility issues, makes it more likely that you can get help. Aside from that, the tub has a couple of other features that set it apart from others. The most notable one is a bank of LEDs for chromatherapy. Chromatherapy, the practice of viewing certain colors and patterns of light for a psychological benefit, hasn’t been explored heavily in this context. It’s certainly an interesting addition. You can buy the tub without this option. This tub comes equipped with all the standard features of a walk-in tub: safety bars, sealed doors, a quick-draining system, and others. It has an anti-slip floor, which we like because it adds to the safety of the tub. Porcelain and other materials frequently get slippery when they’re wet, and this makes it easier to fall and hurt yourself. Anti-slip coating diminishes this risk. The chief benefit we see in this tub is its profile: the extra length gives you plenty of room to lie down and get a soothing hydro-massage with the help of the 24 jets. The overall capacity of this tub isn’t that much larger than most we’ve reviewed. The standard amount, when not occupied by a person, is about 50 gallons, which is what this tub can hold. We like the idea of this tub, but it has a high price tag that doesn’t seem entirely justifiable by the features that the tub has. Even if you don’t pick out one of the tubs we’ve reviewed, below we’ve given you a few pointers on things to look for in your selection. A bathtub is an expensive and time-cconsuming investment; getting the wrong one will be frustrating to no end. The chief difference you’ll notice in a walk-in bathtub compared to other types of tubs is that it almost looks like a shower. It is typically a standing unit that takes up nearly the entire height of the bathroom; it can be fully or partially enclosed. 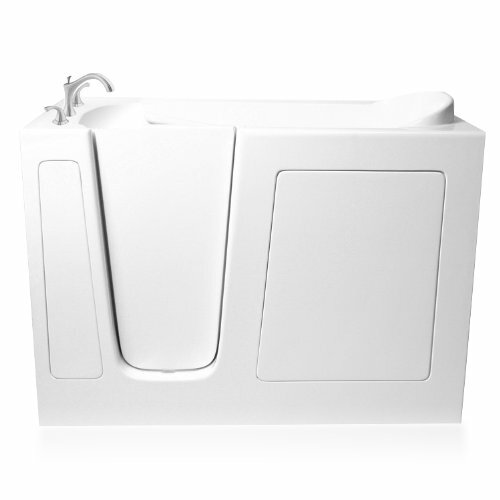 Walk-in tubs often have a hinged door designed to be water-resistant, so nothing leaks out. These tubs are almost always designed for the elderly, who don’t have as much mobility and strength as their younger counterparts. Because of this fact, walk-in tubs are designed with safety and mobility in mind. Most models include a seat; as you get older, you can’t sit down fully in the tub and get back up safely. Therefore, a seat helps to provide the benefits of soaking without jeopardizing safety. Safety bars, handrails, and slip-resistant flooring are usually a part of a walk-in tub assembly to lessen the likelihood of the person slipping. Safety bars should be bolted firmly into the wall other otherwise affixed. A simple screw assembly won’t do the trick; screws come loose too easily and at inopportune times. You should note that safety bars and other support mechanisms can get slippery with water and soap, so it’s best to exercise extra caution. For example, you might get a slip-resistant cover to put on them. Finally, you should make sure the door, if glass, is made of shatter-proof glass if possible. Falling into a door is possible, and having glass break as you fall through it can make an already dangerous situation even worse. Walk-in tubs have their doors open and accessible at ground level. This means that you cannot run water until the door is closed, and the reverse also applies: you can’t open the door and get out of the tub until all the water drains away. 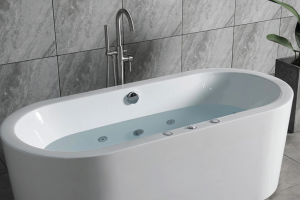 If you don’t buy a tub with the right materials, you could be looking at a cold wait, and if you’re prone to sickness from cold it may not be the best idea. Because of this drawback, you need to pick a walk-in tub made of a material that will retain heat for a longer time than average. Cast iron or enameled steel is usually the best choice; cast iron if possible. This criterion may seem like a trivial thing, but with impaired mobility, everything can make a difference. If the door opens inward, it acts as greater support should you fall in the bathtub, but it makes it harder for emergency responders to get to you. Similarly, outward-opening doors allow more freedom of access, but they don’t support you as much if you fall. Most of the doors you’ll see in a walk-in tub are the standard opening glass doors. Sliding doors, while possible, are a rare sight because they aren’t as safe. Sliding doors can easily come off their tracks. 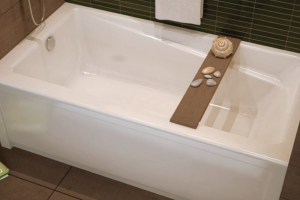 Thus far we’ve talked about the simple soaker tub, which is the most basic and least expensive. A hydrotherapy tub, for example, adds water jets and air jets that cause the water to massage sore joints and muscles. 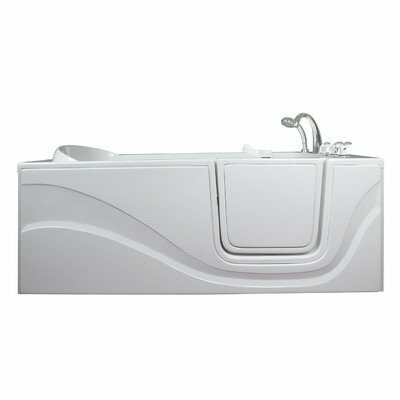 Another type of tub you might see is one designed specifically for wheelchair access. These tubs have outward-opening doors as a rule; they also include detachable, free-moving shower heads. We think all the tubs we’ve listed have something to make them stand out, but overall, the one that gets our pick is the Ariel model. It seems to have the most all-around positive benefits and the fewest substantial problems, and everything we look for in a walk-in bathtub. These factors include a heat-retentive surface, anti-slip floor coating, and accessibility options like a detachable shower head. Not all tubs have this sort of things, so it’s a nice thing to see. A good walk-in tub should be easy to get into, offer the most comfort and convenience possible to the bather, and should provide extra amenities when possible. The priority is being able to access the tub. Make sure it has a low threshold; no more than about six inches is ideal. The threshold should be marked and visible. We hope that our best walk-in tub reviews have been able to give you some insight about how to best outfit your bathroom.